Hello Everyone! I hinted earlier this year that I was making scary progress on my New Years Resolutions. It’s been almost a week now so I can safely say: I got a new job! I’ve been looking for a change for over a year now so I’m super excited about this. The best part? My commute is down to 5 minutes! Such freedom! Has anyone else made progress on their new year’s resolutions? I know at McKinney Knittery I’ve been hearing a lot of “year of the sweater” talk. Some knitters are tackling their first ever sweaters this year! If you’re looking for an easy first sweater, allow me to recommend the Weekender Sweater by Andrea Mowry. I just finished mine in a few short weeks and it was a joy to make. Weekender by Andrea Mowry is a casual pullover with a few special features. Weekender is worked in stockinette, worn purl side out, with a slip stitched detail down the center front and center back. To add an extra layer of quality, Weekender features tubular cast ons (and cast offs) throughout the project. I was hesitant about the tubular cast on and off, since it seemed like an awful lot of fuss, but now that I see the finished project, I find that it adds a lot to the sweater. In terms of difficulty, I found Weekender to be incredibly easy. Even though it’s worn purl side out, you don’t have to purl a whole sweater (thank GOODNESS!). Instead, you work the majority of the sweater inside out. Save for the little slipped stitch every other row, it’s just pure knitting in the round. Plus, the minimal shaping means that you’re less likely to suffer if you don’t get your gauge quite right. I am not exaggerating when I say that out of all my handknit sweaters, my Weekender fits me the best. The pattern is amazing without modifications, but I did make a few modifications to the pattern. I changed the sleeves to make them tighter and shorter. When picking up the sleeves, I picked up 54 stitched, and decreased at the beginning and end of each round every 6th round until I had 42 stitches. I then worked the sleeves straight until they were 10 inches long. I switched to K1 P1 rib for 3.5 inches and finished the sleeves with a tubular bind off. I’m very happy with how my Weekender sweater turned out. The fit is amazing and it’s really easy and comfortable to wear. Sometimes I find that the neck rides up a little high for my taste, and I wonder if changing the short row shoulder shaping would make a difference in that. Despite that, I’ve still been dreaming of making another Weekender in another color and yarn. Maybe a nice millennial pink? I’ll keep you posted. Okay. You are going to laugh. I used Paton’s Classic Wool for this sweater. They have a few marled colors and it was buy 2 get 1 free and I just couldn’t wait. I did it and I don’t regret it. I only used 4 skeins of the light gray marl so this was a really cheap sweater. Sure it’s a little more itchy than I would normally like, but I wear a tank top under mine. The Paton’s actually performed really well in this project. I had no issues with consistency and the finished project doesn’t look cheap at all. It does shed a little bit. That may improve over time. Because I knew I was dealing with a cheaper yarn, I used this project as an opportunity to try Eucalan for the first time! I figured that I nice soak, something I can neglect in my FOs, might add some softness to the rougher yarn. So I filled the sink with water and a few teaspoons of Eucalan and let it soak for an hour or so. After blocking, my Weekender is nice and smooth and comfortable to wear against the skin (though still very wooly). I will definitely use this product again to wash this sweater and others. So there’s my first sweater of 2018. Do you have a sweater on the needles this year? Is one planned for later. I’ve got my eye on a few patterns. I’d love to see what you’re looking at as well. As I’m sure you’ve all noticed by now, I am a sucker for reading lists. I enjoy putting together my seasonal reading lists and now, thanks to Anne at Modern Mrs. Darcy, I am working on a year long reading list. Anne has curated a wonderful set of prompts for a twelve book 2018 Reading Challenge. Twelve books means I could read one for each month, but it’s already February and I haven’t touched any of the books of my list! Don’t worry, I read fast! The first category is obvious, because not a lot of award nominations have gone on yet, so I can’t possible choose. The second category means I might actually have to talk to a librarian or indie bookseller, so I’m going to bench that for a while. I’m contemplating going down to The Wild Detectives in the Bishop Arts District for my recommendation, but I haven’t decided. For the rest of the categories, I have made my decisions and I am excited to share them. Of course, If you have other ideas for the categories, I’d love to hear them. Good recommendations are always appreciated. The options for this category are fairly daunting, to say the least. I thought about reading Frankenstein, because I’ve never actually read it all the way through. I still might. However, I was was more excited by the idea of reading A Wrinkle in Time by Madeline L’Engle. Somehow I missed reading this book as a child. I think perhaps it was labelled as some form of Not for Christian Children reading, but I’m really not sure. I just know that I’m late to the game. Even The Hubs has read this book before me(This is shocking.). It’s being made into a movie that will come out later this year, so I want to read it before I get to many preconceived ideas about it. I just got the email that my hold is in at the library for it, so maybe I’ll even start this one today! This might be cheating, since the recommendation didn’t come personally. However, Shauna Niequist posted on Facebook about how much she appreciated Little Fires Everywhere by Celeste Ng and I thought to myself…she has good taste. I’ve seen this book recommended by others as well. In fact, Anne at Modern Mrs. Darcy listed it as an honorable mention in her favorite books of 2017 blog post. She has pretty good taste too, so I think that I can use her and Shauna combined for this category. I have no reference point going into this book, but I’m excited to try it. I was confused by this category at first so I had to ask. Apparently, A Book in Translation means a book that has been translated from it’s original language. Thankfully, A Man Called Ove by Fredrik Backman fell into this category. But honestly, I’m really reading this because Bobbi at Knit Night can’t stop singing it’s praises. She also falls into the Someone with Great Taste category, and she has recommended A Man Called Ove so warmly that I knew I’d have to read it at some point this year. Am I late to the party here? 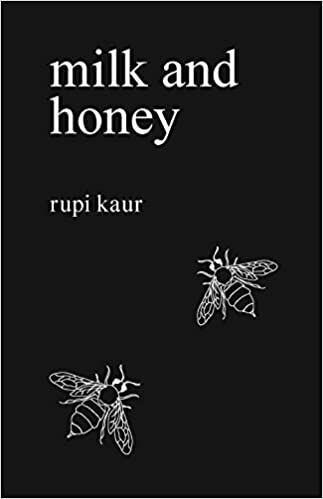 All the sudden it seems like everyone knows who Rupi Kaur is and I don’t. I see her little books everywhere. They must be popular, because I feel like I’ve been on my library’s hold list for MONTHS waiting for this book. I could read it for free through their digital loans, but I don’t want to. Poetry books rely so much on structure and line spacing and sometimes Kindle books mess that up. Nope, I need to read this one in print, so maybe in July when it’s finally on hold for me I’ll let you know how it goes. Not to boast, but this is a very broad category for me. I’ve always been an extremely fast reader, even growing up. My father didn’t believe me. He thought I was skimming. He would make me read a page I’d never read before, time me, and quiz me about it’s contents. I won. So I just picked a shorter seeming book and put it in this slot. We Were Liars by E. Lockhart was recommended to my by two people on facebook, one of which was my old elementary school librarian/babysitter. Girlfriend doesn’t mess around, so I knew I could count on this book to be not only quick, but entertaining. This is also a bit of a classic. I’m getting real literary here. I’ve read Of Mice and Men by Steinbeck like just about every American high schooler, but I’ve never looked at his other works. I am, of course, aware of the Grapes of Wrath (I’ve seen Veggies Tales, I mean, come on). But I never would have chosen to read East of Eden without a recommendation. One of my very closest friends growing up recommended this to me. She was my literary buddy in high school, the person who could talk about Pride and Prejudice with me and also John Green books. So when she recommends a book, I listen. I’m suspecting Steinway will be depressing, but not like Hemingway depressing. I may save it for a summer read. I mentioned him earlier, but I absolutely love John Green’s writing. His characters talk like real teens. His books are witty and funny and painful and deep. When The Hubs was trying to woo me, he read John Green books just to talk about them with me. I have had a copy of Turtles All the Way Down since Christmas, but I’m afraid to start it because I want to be in the right head space for it. I don’t want to be distracted and frazzled and read it in snippets. I want to go through it slowly and savor it. So I’m holding onto it for a little bit longer, and when the time is right, I’ll read it. I actually got this book through a paperback book exchange at a party. I was a little bit leery of it, because books about Native Americans have a tendency to go so terribly wrong. When I was in college, I spent a lot of time studying pre-American Revolution Haudenosaunee (Iroquois) and talking to several Mohawk artists. One of the things I studied was how their history gets twisted for American storytelling purposes(the Indian Princess trope and things like that), so I try to be really sensitive about how they’re portrayed in film and literature. So until I found out that Sherman Alexie was Native American himself, I wasn’t sure I was going to read The Absolutely True Diary of a Part-Time Indian. Now that I’ve done a little research on it, I’m more excited to give it a try. This is probably my biggest departure from my regular reading style on my 2018 reading challenge. I could have done the easy thing and put Hamilton’s biography into this section. Instead, we are going to tackle the Torn: Rescuing the Gospel from the Gays-vs.-Christians Debate by Justin Lee. I’ve seen Justin Lee through a couple post-evangelical bloggers I read. He is well spoken and able to navigate the complexities of both Christianity and Homosexuality. I have never ready anything of his, though. I suspect it will be difficult, but worth slogging through. I love this category. This is what makes the reading challenge more of a challenge. It forces you to pick outside your comfort zone. For this category, I chose Interpreter of Maladies by Jhumpa Lahiri. This was another Modern Mrs. Darcy recommendation. I thought it would be good to read a book by an Indian author as well (even though she was born in London and raised in the US). I have worked for the past 2 years with Indians and for Indian clients. I know some of their quirks but very little of their culture (though, much like American Indians, they are too geographically diverse to really sum up as one culture). I thought this book might help on that point, and besides, I’ve heard it’s excellent. Are you doing any reading challenges this year? Think I should have picked something different for my categories? Let me know! I love adding new books to my want-to-read list!